By October 19th, Atlanta and the state of Georgia will have sent their pitch to Amazon — the world’s largest online retailer — to build its second headquarters, known as HQ2, in the Big Peach. Last month, the Seattle-based company issued a public request for proposals for a second headquarters in North America. HQ2 is expected to employee more than 50,000 people, with an average salary of $100,000, and could require up to eight million square feet of office space. Just about every media outlet in the know, including CNN Money, Bloomberg and Business Insider, have listed Atlanta as a possibility. All that is known is Amazon is looking at cities with more than 1 million people (MSA, 5.7 million), talent (Georgia Tech & Georgia State University) room (plenty) and transportation (MARTA & the world’s busiest airport). 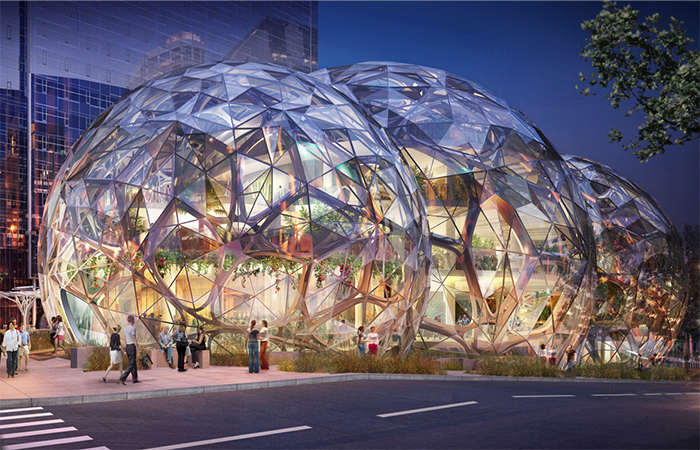 According to the Atlanta Business Chronicle, Amazon is already building out two technology offices in Atlanta, one in Buckhead at Terminus 200 and the other at Atlantic Station. Meanwhile, it has several distribution warehouses ringing the city. It would appear Atlanta is in fairly good shape, though it is likely every city from New York, Boston and Chicago to Miami and Tampa to Houston and Dallas to Los Angles and San Francisco and everywhere in between will be making major pushes. The city of Stonecrest, Georgia has boldly set aside 345 acres it will rename “Amazon, Georgia,” if the online behemoth relocates there. Dorsey Alston would like to know where the HQ2 would go if Atlanta were chosen. A few people have nominated the Gulch, an area surrounded by elevated streets, which allowed the railroad to pass through downtown Atlanta in the 20th century. It is now a mess of surface parking lots next to Mercedes Benz Stadium and Philips Arena. Midtown makes sense given the proximity to Tech, and Business Week recently pointed out, developer John Dewberry has arguably the most valuable undeveloped sight in the South at the corner of Peachtree and 10th streets. We also wonder about the former GM Automotive plant in Doraville, which is currently being redeveloped as Assembly and sits on a MARTA rail line. There are other questions as well, including what kind of tax breaks will be needed to land such a prized catch, but all of that will be public record soon enough. For now, we’ll sit back and cheer Atlanta as it makes a run at what is being called the Olympic Games of Corporate America. We’ve done it before successfully. We can do it again. Where in Atlanta would you like to see Amazon set up shop?